The Nigerian militant Islamist group Boko Haram has grown increasingly virulent since late 2010, reflecting a major transformation in its capacity, tactics, and ideology. There are indications of expanding links between Boko Haram and international Islamist terrorist organizations. Support for Boko Haram among some of northern Nigeria’s marginalized Muslim communities suggests that security actions alone will be insufficient to quell the instability. The reemergence of the Nigerian militant Islamist group Boko Haram is cause for significant concern. Since late 2010, the organization has been responsible for a brutal campaign of attacks targeting public officials and institutions and, increasingly, ordinary men, women, and children, wreaking havoc across northern Nigeria. At least 550 people were killed in 115 separate attacks in 2011, a grisly toll that has been accelerating. Meanwhile, Boko Haram’s rhetoric and tactics indicate that the organization has expanded its reach well beyond its original base in northeastern Nigeria. Indeed, it may be evolving into a transnational threat with links to other terrorist groups and violent extremists in North, West, and East Africa. The group thus constitutes a wider threat to the political, economic, and security interests in Africa. Given that Nigeria is Africa’s biggest oil exporter (it holds the world’s 10th largest proven reserves) as well as the continent’s most populous country, instability there has significant global implications. Boko Haram first received widespread attention for the armed attacks that it launched against police stations and other public buildings in the towns of Geidam and Kanamma in Nigeria’s northeastern Yobe State in late December 2003. However, the emergence of the militant sect cannot be understood without reference to the social, religious, economic, and political milieu of northern Nigeria. While murky, some accounts link the group’s origins back to the Maitatsine1 uprisings of the early 1980s, which left thousands dead and cut a path of destruction across five northern Nigerian states. The Maitatsine movement took its name from an Islamic preacher, Muhammadu Marwa, who moved from his native Cameroon to northern Nigeria around 1945. His polemical sermons, aimed at both religious and political authorities, earned Marwa the sobriquet “Maitatsine” (in Hausa, “he who curses”), as well as the ire of British colonial authorities who had him deported. Maitatsine eventually returned to Nigeria sometime after its independence and, by the early 1970s, had gathered a large and increasingly militant following, the Yan Tatsine (“followers of Maitatsine”), of youths, unemployed migrants, and others who felt that the official Islamic hierarchy was unresponsive to their needs. Maitatsine was killed by security forces during a December 1980 insurrection in Kano, but his followers rose up again in 1982, 1984, and 1985. Both Yan Tatsine and Boko Haram can be described as fanatical sects whose beliefs are not held by the majority of Nigerian Muslims. In their denunciation of Western civilization, both also came to reject the legitimacy of the secular Nigerian state, invariably described as dagut (“evil”) and unworthy of allegiance, and ended up waging war against it in an effort to replace it with a “purified” Islamic regime. In both cases, police were unable to quell the outbreak of violence, and military forces had to be deployed. The passage of time between the two movements has been marked by persistent corruption and relatively few improvements in the socioeconomic conditions of northern Nigeria, leaving many communities in the North with the perception that they are falling further behind their counterparts in the (mostly Christian) South.2 This has heightened the receptivity of Boko Haram’s message promising a radical transformation of Nigerian society. The introduction of Islamic law (shari’a) in the 12 northern Nigerian states since 1999 (see map) was deemed insufficient by Yusuf and his followers, who argued that the country’s ruling class as a whole was marred by corruption and even Muslim northern leaders were irredeemably tainted by “Western-style” ambitions. Their envisaged “pure” shari’a state would ostensibly be both more transparent and just than the existing order. That the group has little regard for the country’s traditional Muslim hierarchy was underscored in early 2012 when its spokesman, Abu Qaqa, threatened attacks on the historic seat of the Nigerian caliphate in an open letter to the Sultan of Sokoto, Muhammadu Sa’ad Abubakar III. After its initial 2003 attacks were repelled, Boko Haram followers regrouped at a base in Yobe State on the border with Niger, which they dubbed “Afghanistan” after hoisting the Taliban flag over the encampment, although they had no links with their Afghan counterparts. Subsequently, the group was given the name the Nigerian Taliban by “the local people who despised the philosophy and teachings of the sect.”4 Nevertheless, its number gradually increased as students from various local universities and technical institutes withdrew from school and joined the group for Koranic instruction. By mid-2004, Boko Haram had gathered enough strength to attack a few police stations in neighboring Borno State, killing several policemen and stealing arms and ammunition. The police counterattacked and killed two dozen members. This set the pattern for the next few years, with Boko Haram carrying out occasional assaults on police, who responded with raids and arrests. Overall, however, this period was characterized by an unofficial truce between the group and Nigerian authorities. Yusuf was even able to establish a mosque and school in Borno State’s capital, Maiduguri. The relative calm ended on July 26, 2009, when a security raid on a Boko Haram hideout in Bauchi State led to reprisal attacks on police and 5 days of subsequent rioting, which spread across Bauchi, Kano, Yobe, and Borno. In response, security forces besieged and stormed the group’s mosque compound in Maiduguri. The violence finally petered out after Yusuf was captured, beaten, interrogated, and finally shot—supposedly while attempting to escape—but not before more than 700 people were killed and numerous public buildings, including government offices, police stations, schools, mosques, and churches, were destroyed. With most of its leaders as well as several prominent financial backers dead—including Alhaji Buji Foi, a former commissioner for religious affairs in Borno State—the group receded from public attention and a number of analysts argued that it was hopelessly fractured, if not altogether finished. Two months later, on September 7, 2010, Boko Haram fighters dramatically broke into a federal prison in Bauchi State and freed more than 100 of their fellow members who had been awaiting trial since the previous year’s uprising. In the process of the assault, involving bombs and automatic weapons, the militants also let out more than 750 other prisoners and scattered leaflets warning of further violence. The latter was not long delayed. On Christmas Eve 2010, the group set off a string of seven improvised explosive devices (IEDs) in Jos, Plateau State. The bombings, which targeted the town’s Christian communities, left 80 dead and scores of others wounded. The group subsequently carried out a number of other attacks—mainly small IEDs thrown from moving vehicles or planted near targets in Maiduguri and Bauchi—aimed primarily at candidates in the 2011 elections that it had denounced. The elections, considered by Islamist hardliners to be a forbidden “innovation” (bid’ah) imposed by the West, were already contentious in that a significant number of Muslims, especially in the Northeast, deeply resented the candidacy of President Goodluck Jonathan, a southern Christian who had succeeded President Umaru Musa Yar’Adua, a northern Muslim, after the latter’s unexpected death in 2010. The decision by Jonathan to seek a full term in his own right upset the informal compact within the ruling People’s Democratic Party whereby the presidency alternated every 8 years between Christians, who dominate the southern part of the country, and Muslims who dominate the North. Meanwhile, Boko Haram continued to target Muslim figures who opposed it. The mounting toll of victims included the brother of the Shehu of Borno, the traditional ruler of the Kanuri people of northeastern Nigeria, southeastern Niger, western Chad, and northern Cameroon; Ibrahim Ahmad Abdullahi Bolori, a prominent Maiduguri cleric who had criticized Boko Haram; and Ibrahim Birkuti, a cleric in southern Borno State who was also well known for his criticisms of the sect. On June 16, 2011, Boko Haram demonstrated a significant and ominous tactical and operational upgrade in its capabilities when it launched a suicide attack using a vehicle-borne IED. Believed to be the first suicide attack in Nigeria, the operation targeted the Inspector General of the Nigerian Police Force, whose convoy the terrorist followed into the police headquarters compound in the federal capital of Abuja. Security was able to detain the suspect vehicle, but the explosion nevertheless killed two bystanders and was large enough to destroy several dozen police vehicles parked nearby. In fact, the incident showed that far from being a spent force, Boko Haram had adopted one of the deadliest instruments in the jihadist arsenal and had demonstrated that it was now capable of carrying out attacks far from its usual areas of operation. Two months later, on August 26—after having spent the interim carrying out more than a half dozen smaller attacks on government officials, establishments that serve alcohol, and churches—Boko Haram carried out another major attack, sending a suicide bomber with an explosives-laden car into the United Nations (UN) offices in Abuja. Twenty-five people were killed and at least 80 were wounded. This attack, the first by the group against an international target, as well as the video it subsequently released of the bomber offering praise to slain al Qaeda leader Osama bin Laden and referring to the UN as a “forum of all global evil,”9 put it squarely in the ranks of terrorists who have specifically targeted UN agencies in Afghanistan, Iraq, and Algeria. After the attack on the UN, there was little let up in the violence, which has included a number of complex operations, including the November 4, 2011, assault on Damaturu, capital of Yobe State, which involved suicide attacks on various police stations followed by the massacre in the Christian quarter of the city of 150 people; the Christmas morning bombing outside the Catholic church in Madalla, near Abuja, which killed at least 32 as they exited Mass, and 4 other explosions elsewhere; and the coordinated January 20, 2012, attacks in Kano, Nigeria’s second-largest metropolis and the Muslim North’s economic, political, and cultural hub, which left more than 185 people dead. The attacks in Damaturu and Madalla are consistent with the ultimatum that the group has issued demanding Christians leave northern Nigeria. While Boko Haram’s declared political objective of replacing the Nigerian state with an Islamic polity ruled by shari’a is understood, little is actually known about the group’s current leaders or members. 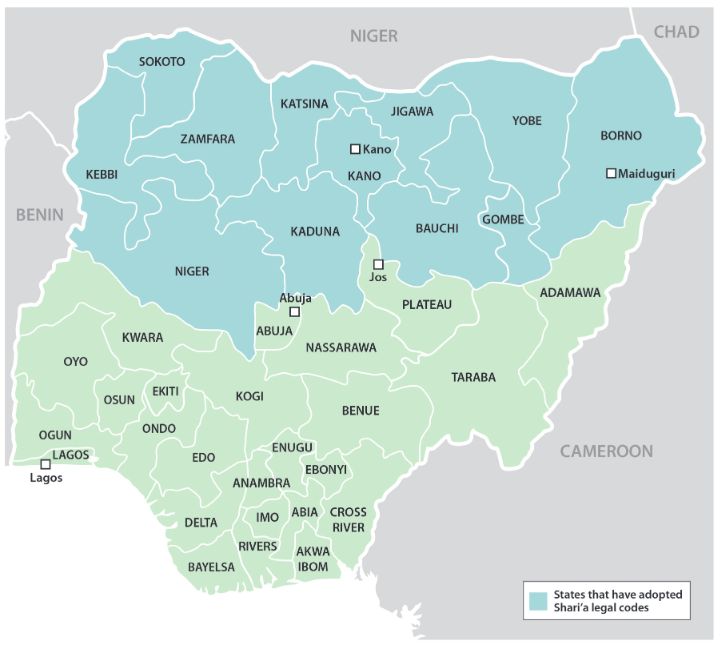 It seems to enjoy a degree of support in northeastern Nigeria—especially the states of Borno, Yobe, Gombe, and Bauchi. Nonetheless, analysts estimate active militants to number in the low hundreds, with perhaps as many as a few thousand supporters engaged to varying degrees. While Abubakar Shekau has asserted his leadership and evidently proven successful in achieving a sufficient level of organization to maintain a punishing pace of coordinated attacks, the organization is still comprised of a composite of different actors, ranging from Islamist militants to disaffected citizens to opportunistic criminals and hooligans, including some who have been encouraged by politicians keen on exploiting the ensuing violence and instability to advance their own political agendas. Perversely, both the government and militants have found it convenient to ascribe to Boko Haram as much of the disorder in northern Nigeria as possible. An exception was the killing of two European hostages in March 2012 following a failed rescue operation by British and Nigerian forces that Boko Haram may have thought could draw in a major outside power, an outcome which the militants clearly wanted to avoid. While one should be cautious about asserting connections between different terrorist organizations and other militant groups in the absence of credible evidence, one should also be wary of arbitrary distinctions and classifications that do little justice to more fluid realities. AQIM has never hidden its ambition to bring in Nigerian Islamists in order to exploit tensions between Nigerian Muslims and Christians. That being said, there are some tantalizing linkages between Boko Haram and other militant movements. The former has clearly absorbed the signature tactic of some of the latter: the use of vehicle-borne IEDs in repeated attacks against high-profile public targets, resulting in a spectacular increase in casualties, especially in cases where the bombs are deployed in near-simultaneous or otherwise coordinated attacks. At the very least, the existence of suicide attacks indicates some level of foreign influence since such episodes had been practically unknown in Africa until recent years when they became a part of AQIM’s repertoire. AQIM itself has had a discrete number of Nigerian recruits since the Algerian Groupe Salafiste pour la Prédication et le Combat (GSPC, or the Salafist Group for Preaching and Combat) was rebranded as al Qaeda’s franchise in the region, a fact Abdelmalek Droukdel acknowledged in 2008 when he gave an extensive interview to the New York Times.10 And the group has never hidden its ambition to bring in Nigerian Islamists in order to exploit tensions between Nigerian Muslims and Christians. It is noteworthy, in fact, that both AQIM and Boko Haram leaders have issued statements complimenting each other and pledging mutual support. Tellingly, AQIM has permitted the Nigerian group to employ its media operation, al Andalus. Given the varied economic, social, and ideological appeal that Boko Haram has within certain communities in northern Nigeria, a sustained and comprehensive strategy is required to respond to the security challenge the group poses. Invest in better information and analysis. Despite the importance of Nigeria and the significance of the challenge it faces, what is actually known and reported is amazingly limited. Some of the analysis can, at best, be described as wishful thinking—such as the frequently reported, but never confirmed, divisions within Boko Haram between followers of the slain Mohammed Yusuf who wanted to focus on the transformation of Nigeria into their version of a shari’a-compliant state and those who believe that the state must first be brought down. Moreover, the Nigerian federal and state governments need to do more to build relationships with one another and with the local communities in which Boko Haram operates if they are to acquire the type of actionable intelligence needed to prevent future attacks. Encourage the Nigerian government to deal forthrightly with the threat. In any event, the escalating scale of the attacks seems to have shaken the Nigerian government out of any complacency. President Jonathan has moved aggressively both to offer the possibility of negotiations and threaten the rigorous application of force. This political will needs to be reinforced in messaging at all levels from the country’s partners. At the same time, confronting Boko Haram will require that the government carefully measure its response. Ham-fisted security operations such as the “Operation Flush” security sweeps in the northern part of the country have succeeded in little except to further inflame public opinion against the government. The government must also better address the many legitimate grievances that have rendered meaningful segments of the population in the North amenable to the militant group’s message of overturning the status quo in Nigeria. Frustrations with living conditions are keenly felt in northern Nigeria, where the proportion of the population living below the poverty level is between two and three times the rate in the South. Dramatic action is needed to end corruption, build a more inclusive government, alleviate poverty and lack of access to health care, expand access to education, and create a transportation, utilities, and communications infrastructure capable of sustaining economic growth for Nigeria’s 170 million people. Prioritize specialized training for Nigerian security forces. Undoubtedly, the Nigerian security forces, both military and police, could use some assistance in the fight against Boko Haram. However, the need is less a matter of personnel and equipment than training, especially in intelligence and investigations. Due caution should be exercised to maintain the lightest possible international footprint lest this support itself become an issue that militants can exploit. That being said, tailored efforts can help Nigerian forces strengthen their civil-military affairs capabilities to facilitate interactions between military forces and civilians, especially in the North. Strengthen regional cooperation and the capacity of neighboring countries. Boko Haram has used Nigeria’s porous borders and the limited capacities of neighboring countries to its advantage. A January 2012 report by the United Nations noted that Boko Haram members received training in Mali the previous summer and that seven were arrested in Niger with names and contact details of AQIM militants.15 Regional efforts, such as the U.S.-sponsored TransSahara Counterterrorism Partnership that supports small mobile training teams, civil-military engagements, and development programming should be adapted to include areas in which Boko Haram has thrived. Greater cooperation and intelligence-sharing between states in the region need to be encouraged and facilitated by international partners. The fact that Boko Haram has not only survived the harsh reprisals of 2009 but has also since been able to expand both the reach and scope of its operations ought to be a wakeup call to both the Nigerian government and international community. The suicide bombings targeting symbols of Nigerian state authority and international engagement represent a major advance in Boko Haram’s capabilities and a significant shift in its message. The effect not only discredited the efforts of Nigerian officials to trivialize the group as an insignificant localized problem but also called into question the assumptions of security analysts abroad who have long minimized the risks violent Islamists posed to Nigeria. The upsurge in attacks in Nigeria, when coupled with developments elsewhere in the Sahel, are a vivid reminder that extremism and violence cannot easily be contained by arbitrary divisions, whether on maps or in analytical frameworks. Consequently, the emergence of Boko Haram and its burgeoning capacity for violence ought to be recognized as both a national and transnational problem—and addressed as such. Dr. J. Peter Pham is Director of the Michael S. Ansari Africa Center at the Atlantic Council in Washington, DC. ⇑ Elizabeth Isichei, “The Maitatsine Risings in Nigeria 1980–1985: A Revolt[ed] of the Disinherited,” Journal of Religion in Africa 17, no. 5 (October 1987). ⇑ John Campbell, Nigeria: Dancing on the Brink (Lanham, MD: Rowman & Littlefield, 2011). ⇑ Joe Boyle, “Nigeria’s ‘Taliban’ Enigma,” BBC, July 31, 2009. ⇑ Freedom C. Onuoha, “The Islamist Challenge: Nigeria’s Boko Haram Crisis Explained,” African Security Review 19, no. 1 (2010), 55. ⇑ “Al Qaida Makes Move on Troubled Nigeria,” UPI, June 17, 2010. ⇑ J. Peter Pham, “Foreign Influences and Shifting Horizons: The Ongoing Evolution of al Qaeda in the Islamic Maghreb,” Orbis 55, no. 2 (Spring 2011). J. Peter Pham, “The Dangerous ‘Pragmatism’ of Al-Qaeda in the Islamic Maghreb,” Journal of the Middle East and Africa 2, no. 1 (January–June 2011). ⇑ Nick Tattersall and William Maclean, “Nigerian Sect Leader Praises al Qaeda, Warns U.S.,” Reuters, July 13, 2010. ⇑ “Nigerian Islamists Vow ‘Fiercer’ Attacks,” AFP, June 15, 2011. ⇑ “Nigeria UN bomb: Video of ‘Boko Haram Bomber’ Released,” BBC, September 18, 2011. ⇑ “An Interview with Abdelmalek Droukdel,” The New York Times, July 1, 2008. ⇑ Interview with Senior Officer, African Union Mission in Somalia (AMISOM), Mogadishu, December 6, 2011. ⇑ J. Peter Pham, “Next Front? Evolving U.S.-African Strategic Relations in the ‘War on Terrorism’ and Beyond,” Comparative Strategy 26, no. 1 (2007). ⇑ Jean-Luc Marret, “Al-Qaeda in the Islamic Maghreb: A ‘Glocal’ Organization,” Studies in Conflict and Terrorism 31, no. 6 (June 2008). Jean-Pierre Filiu, “The Local and Global Jihad of al-Qa’ida in the Islamic Maghreb,” Middle East Journal 63, no. 2 (Spring 2009). ⇑ “Nigeria’s Goodluck Jonathan: Officials Back Boko Haram,” BBC, January 8, 2012. ⇑ Adam Nossiter, “In Nigeria: A Deadly Group’s Rage Has Local Roots,” The New York Times, February 26, 2012.